Only 90 ever made ~~ No Longer available from Publisher! "Fifty years ago, the King of Rock n Roll bought the palace that became, for him, a sanctuary from the demands of a very public life, and for devotees of American pop culture, a Mecca that grows only more famous with the passage of time. Graceland is one of the most visited homes in America, where legions of fans come to embrace the memories and the music of the undying rock legend, Elvis Presley. I grew up with Elvis great songs and movies; my older sister was a huge fan who played his records until she wore them out. Ive grown to appreciate the energy and high spirits the King contributed to what has become classic American culture. 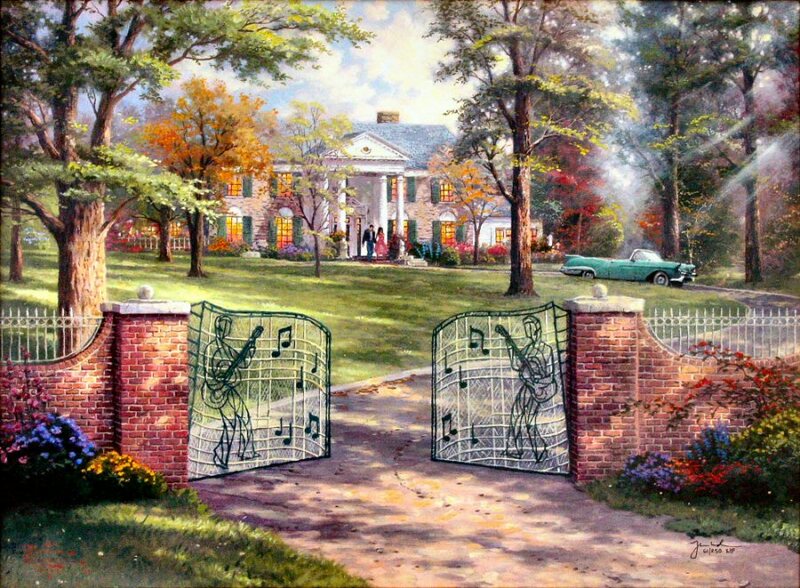 So, naturally, I was delighted when I got the opportunity to paint the official 50th Anniversary portrait of Graceland . 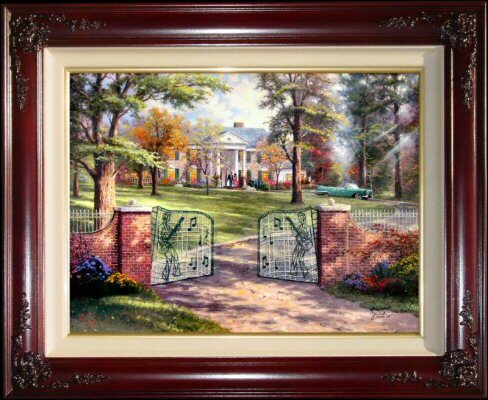 I set up my easel at Graceland on a crisp autumn morning when the stately home was particularly cozy and welcoming. I was inspired to paint it with smoke curling from the chimney and a golden light blazing in every window. I finished my sketchy plein-air study in just a few hours, and then took Graceland, 50th Anniversary to my studio where I created an image that includes such finishing touches as a likeness of the King and one of his famous cars. The finished canvas is being offered as a Limited Edition release to honor the 50th Anniversary of Graceland a home like no other."